A team of surgeons reported Friday that they have completed a hand transplant on a man in his 30s, marking the first time that a surgery replacing a hand has taken place in South Korea. 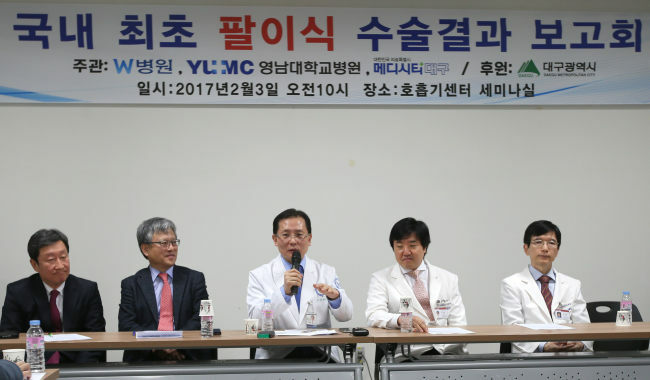 The 25-strong team, led by W Hospital chief Woo Sang-hyun, transplanted the hand of a man in his 40s who had been pronounced brain dead. The procedure took 10 hours starting at 4:00 p.m. the previous day at the Yeungnam University Medical Center in the southeastern city of Daegu. The body part being transplanted was a left hand that included 5 centimeters of the forearm. "We confirm the recipient is in stable condition with his pulse and blood pressure normal, although his body is swollen due to a long operation," Woo told a press conference held after the surgery. Woo also said the patient has good blood circulation in the transplanted hand and the fingers have been observed moving. Hand transplants, which demand a high level of complicated surgical skill, have been conducted worldwide since 2000. The United States reported the world's first successful case in 1999. About 70 hand transplants have been completed so far and 90 percent of them have turned out to be successful.